Automotive exhaust systems are designed to move hot gases from the engine to the rear of the car and into the air stream. These gases/contaminants include Particulate matter (PM), Sulfur dioxide (SO2), Carbon monoxide (CO), Nitrogen oxides (NOx) and Hydrocarbons (HC) and if inhaled by passengers can cause asphyxiation. After the engine's combustion process the exhaust valve opens in the cylinder head allowing the hot gases to enter the exhaust system where an exhaust manifold is made of cast iron or tubular stainless steel is bolted to the cylinder head which is bolted to a head pipe. This is where the primary or position 1 oxygen sensor will frequently reside. Due to the constant hot and cold the exhaust system expands and contracts which can causes welds to break and gaskets to leak. In snowy areas salt is used which will cause the system to rust at an accelerated rate. Fortunately it's easy to tell if the system is having a problem because you will hear it under load. Try to listen for the origin of the noise which can tell you which part of the system is having an issue. Problems can be detected by a simple inspection any exhaust leak should be repaired immediately to avoid asphyxiation. Most cars and trucks have what's called a catalytic converter which is responsible for super heating the gases to burn any excess fuel left over from the engine. On diesel engines a particulate filter (DFP) is used to catch soot, a byproduct of combusting diesel fuel. These filters go through a burn off process where the filter is forced to super heat incinerating the filter grids clean. A catalytic converter cannot be cleaned. Many odors can be related to the exhaust system due to the natural heat and smell of fuel being spent but certain malfunction can cause additional smells which indicate a problem. A sweat or pungent smell can indicate a blown head gasket while rotten egg odors are related to an over worked catalytic converter which can be normal due to extreme usage or a malfunction allowing too much fuel to be burnt. There are endless configurations of exhaust systems from the very loud (free flowing, low restriction) to the barely audible depending on application and manufacturer preference. In general the louder the exhaust the more flow (power) the system will have. While standard exhausts are designed to be cost efficient a performance system is usually made from higher grade of materials configured to gain more horsepower. Systems can be a free flow muffler to a full performance package including headers which replace the more restrictive exhaust manifolds (consult state and federal emissions laws before modifying a vehicles exhaust system). When parking your car be aware the system is very hot and can start a fire if you park your car on dried brush such as a grassy field. If you must park your car in a questionable situation allow it to cool first. Never apply cold water to a hot exhaust system because it can cause the catalyst to break apart inside the catalytic converter. The following images explain the exhaust system featured from front to rear describing it's components and their operation. Exhaust manifold and heat shield: Bolted to the cylinder head this part is first to receive the engine's exhaust. The heat shield is to protect against burns and damaging other components inside the engine bay. After collecting the gases the manifold funnels them into the manifold flange. The head pipe bolts to the exhaust manifold flange. Exhaust gases travel to the catalytic converter which may house an oxygen sensor. The converter is also protected from the body using a heat shield. Once the gases are treated by the catalytic converter and read by the oxygen sensor they are released into the primary transfer pipes. Once exhaust gases have been processed through the balance collector they travel down the secondary transfer tubes which route over the differential or axle. A muffler is used to help quite the engine noise. 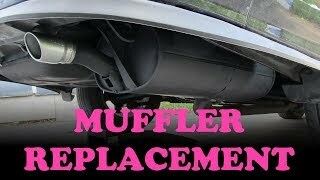 A secondary muffler is sometimes used and referred to as a resonator which increases the muffle affect. Rubber hangers are used to suspend the system while insolating engine vibration from the vehicle. Exhaust gases are released into the atmosphere through the tail pipe which is connected to the muffler. Usually this tail pipe is protected by shield which helps defuse the exhaust. Our mechanics are waiting to answer you questions for free.